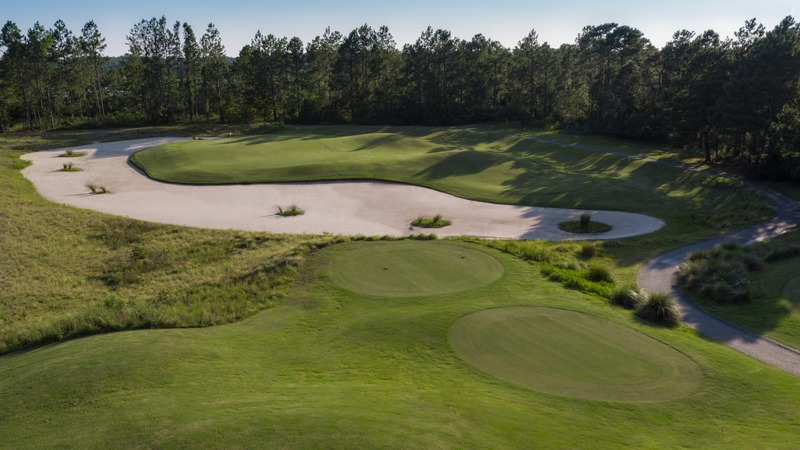 The Legends Resort Moorland Course is unlike any other course in the Myrtle Beach area. Considered one of the greatest challenges on the East Coast, the course is a par 72 triumph. P.B. Dye designed the Moorland and it opened for play in 1990. New Champion bermuda greens were installed in the summer of 2018, further enhancing this great layout. Large expanses of natural growth, sand, water and waste areas combine with extraordinary undulations and bulkheads to present a course reminiscent of the PGA West Stadium Course. This course will test the courage of every golfer, regardless of playing ability. This controversial golf course in Myrtle Beach is definitely a “target” golf course. Created in the Dye tradition, Moorland will cause golfers to rise to incredible heights on the sculpted terrain, sink to considerable depths in the bunkers and employ every ounce of skill and luck in their possession. Large greens provide multiple opportunities for approach shots, and the greens consistently roll at a good pace. The putter becomes an important factor in scoring on this course. The Legends Resort features onsite golf course accommodations, and three onsite golf courses. These 3 courses include the Moorland course, the Heathland course and the Parkland course. A lighted driving range and vast practice facility, as well as a Scottish pub make this resort a complete golfers’ paradise. There are many great packages offered by the Legends Resort, and all rounds include complimentary breakfast buffet, lunch and 2 draft beers.